It has taken me a couple of years to accumulate all of these items and I'm hoping that by the time I retire this fall porch is a fall wonderland but it's about the journey right? So my fall porch is a reflection of me today. Of a DIY'er on a budget! I hope you will find some inspiration to add one of all of these ideas! Small porch, no porch, front door, side door, house, apartment... these ideas fit everyone! Let's start with the focal point- the front door. I like to keep this the center of attention because that is what it is! This berry wreath and welcome sign frame the door nicely. And how about this adorable doormat I DIY'ed! You can find the full tutorial for that here. I think it's just the cutest touch! Here is a tip I have for anyone else out there who is budget conscious. Faux, faux, faux! I am alll about faux pumpkins. Nowadays, you can find faux pumpkins that look so realistic! I've been collecting various faux pumpkins and gourds each year for my outdoor display and while real pumpkins aren't necessarily outrageously priced it's just one cost I can cut! (Except for the annual pumpkins that we carve- that's a different story!). Another unexpected detail I have loved seeing in fall decor lately is using rain boots as planters. Let's focus on the other side of the porch! Fall is all about cozy and I love the touch of comfort a simple blanket draped on the chair adds. I wouldn't necessarily use a fancy throw outside but I picked this one up at Ikea a few years back and it's not necessarily the softest blanket so I feel it's perfect for outside! You could also use a large blanket scarf if you have one! I love to use pieces in unexpected ways like this glass terrarium I used to hold some small pumpkins! So there you have it! 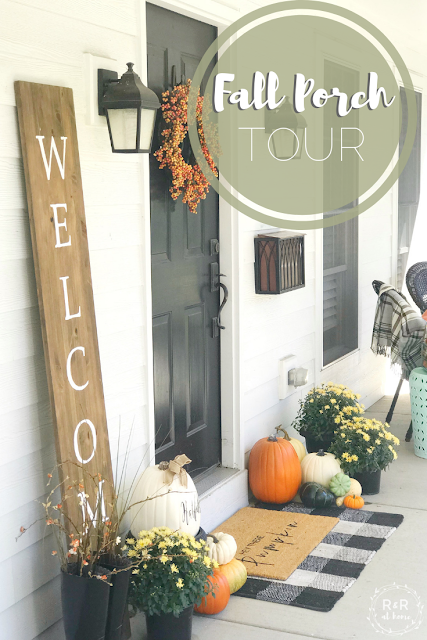 My fall porch tour! I hope you enjoyed this tour and found some inspiration! Be sure to check out all of the other bloggers participating in this tour! You will not be disappointed! Rebecca, your fall porch is beautiful! I love the black and white touches. The chairs on your porch are so inviting! Hi Stacey! Thank you so much for stopping by! I had so much fun styling my porch! You've got such a lovely front porch! LOVE the stacked door mats - that buffalo check mat is adorable! Hi Rebecca, what a super cozy porch you created. The large wooden WELCOME sign is the bomb. You took such professionally looking pictures as well! Happy Fall! Hi Christine! Thank you so much! :) I had so much fun decorating this porch! love doing this with you! Your blog is darling and so is this porch!!!!!! Thank you! This was such a fun blog hop! Love your porch. Super cute idea to use your rain boots as planters! I also adore your two mats. Happy fall! Thank you so much for stopping by! I had so much fun on this blog hop! It looks so cozy and inviting! Happy to be joining in this fun Hop with you! Thank you! That was my goal with this porch! I am having so much fun on this hop! Love everything here! I adore the "Hey there pumpkin" doormat - just too cute! The rain boots with the foliage is a nice touch and it makes me think of the rain that always comes with Fall. So happy to be hopping with you this week! Thank you so much! 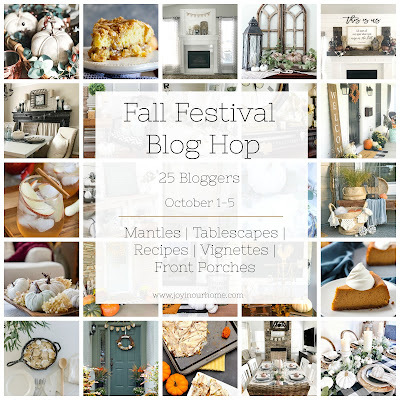 I had so much fun on this fall blog hop! Oh I love the boots with the twigs in them! And that cozy looking plaid blanket :) So happy to be in the hop with you! Thank you so much! This was such a fun blog hop! Happy fall! Thank you so much for stopping by! What a fun fall blog hop! Happy fall! Rebecca, I am swooning over your porch. Porches like yours make me want to have a front porch even more! It is beautiful! It was so fun touring with you this week! Thank you so much!! I am flattered :) I had so much fun on this hop! Thank you! This was such a fun space to decorate! Happy Fall to you!